Listen World! Disabled cry for life! Bruno is an IT expert (since 1981), speech rcognition (e.g. CSE), was and is ready for relocation start working (need a forward time for new glasses since mistreatment of German officials) – last test result ‘you passed with flying colours and can start at August 1st.‘ – we avoid further information about leisure interest, health,…… than ther parties reading this too. 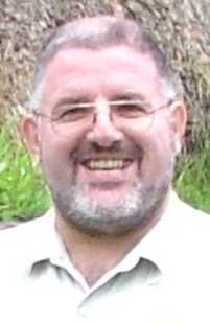 SAFOB = Supporters And Friends Of Bruno – we support as good we can, first our work, family, local social and political work – and than Bruno. 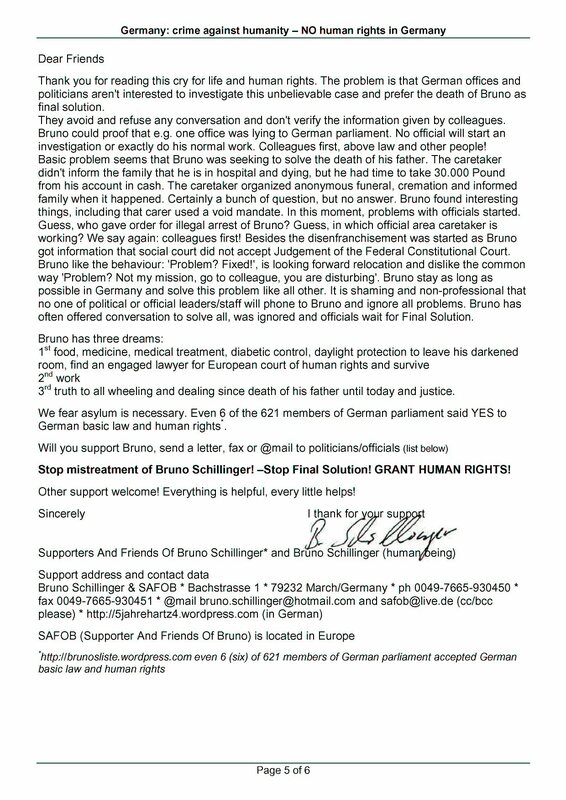 We are not in Germany and we can’t do secretarial work as German officials expect instead support Bruno direct. 1. When started your problem in Jobcenter/ARGE? July 2005 – contract ended April 2005, new position in IT, permanent, full-time, start date Aug. 1st. 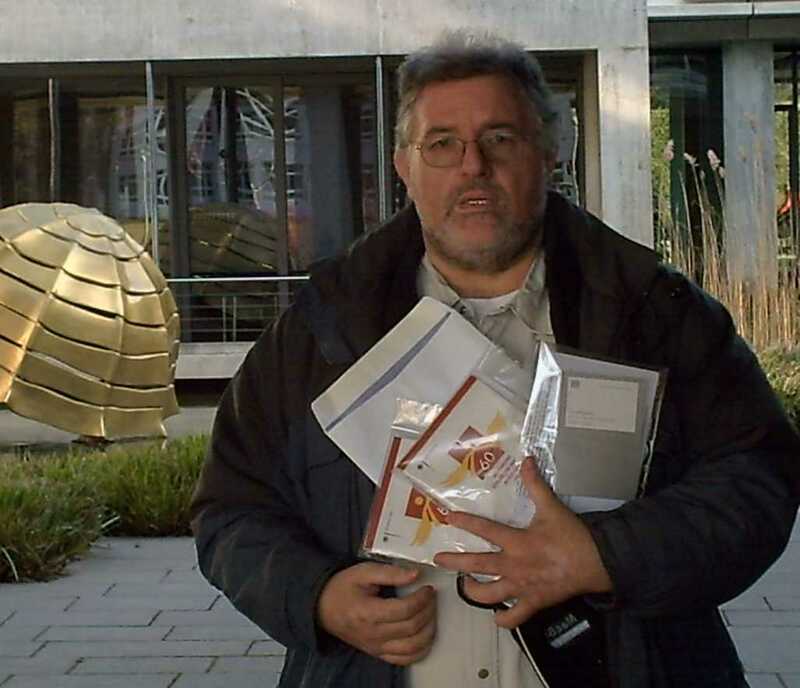 2005 – only one question: How can Bruno finance the move? NO answer – NO rejection, nothing. Months later we got information that a loan would have been possible and normal, with any problems. And this was the begining of all problems. 2. How long have you had your skin disease and how have you managed it? Before 1990 – daylight protection – avoid daylight – and very simple: early to work, home late . 3. You was illegally arrested, abducted and subjected to, was there a reason? We can add an article about this mistreatment – interesting was that a politician and member of jobcenter/ARGE gave this order and police worked as servant – they didn’t ask for an arrest warrant! 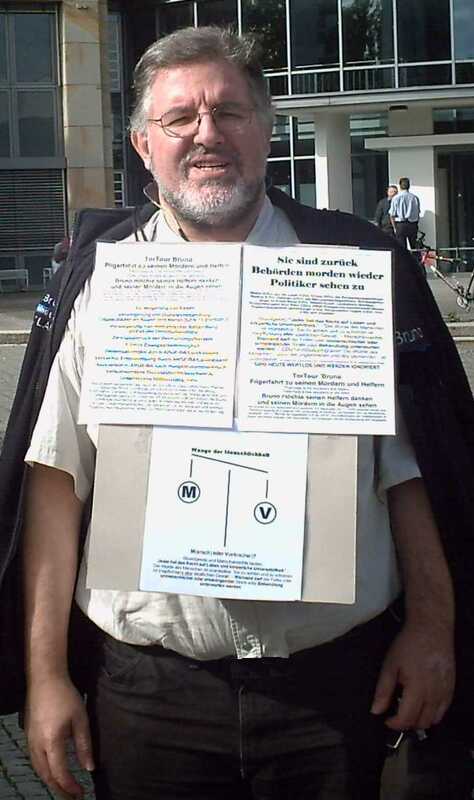 This is German police – no one is interested find the truth. 4. What happened after this arrest? Saturday Morning they came, did know, that I’m diabetic and had big pain (neck problem) – they took me to jail, we had to wait for hours in front of the jail and then they said’you can go, we have no warrant. “No money, no mobile, no food, no water – they just went away and I had 12 km to go home – in the daylight. Contact with Bruno Schillinger? Use phone please. Because he can not read at present by the abuses of the ARGE/social security office itself and we are not on site. He lives alone in a single-room flat – has to lie flat, due to chronic neck and leg pain, avoid daylight because skin disease, no painkillers because kidney damage – we have organized a phone support to check signs of life, but we (SAFOB) aren’t in Germany and so no one can read letters.